I have an issue on all browser using DatePicker component with Primefaces 7.0.RC1. I am using the following code, very similar to PrimeFaces showcase. Unfortunately, I couldn't replicate it. Please attach a sample maven project for us to replicate. The jquery-plugins issue is fixed for 6.2.15. But, I couldn't replicate the main issue. Thanks for the fast reply. I use now p:calendar and everything works fine. Please don't close or do any more releases until we sort this one out It is a legit issue. Affects 6.2.14 and the output script resolves referencing errors but the widget is not ready for production in any form. OK, So i've gone through this widget with a fine tooth comb - this entire thing is broken. I have no idea how you are making it work but I'm guessing it's got to do with everyone else you have on the showcase page. If you can't replicate it then what it is downloadable from the site is not what you are using, in which case please give us access to what you are using to try replicate with. 2) Add in migrate cause it's a JQuery 1.12 library and there are too many changes to simply use JQuery 3 without modifications and without migrate. 3) Override the DatePicker and DatePickerRenderer to do the right things. I just ignored PrimeFaces output and rendered what is required from the API, they are nothing alike and I need this to work. Please use the first snippet to replicate the broken datepicker. Ok so it's definitely the JS, and encodeEnd, and and and and, there's a lot broken. I've put together a working one that we can use, but its definitely not "lint"
Problem 2 : The JS rendered is wrong. I had to rewrite the encodeMarkup, encodeInput and encodeScript methods. I did not do this the pretty way. I am not using the PF widget library because I don't want to go through that hassle so am rendering it myself. Open the DatePickerRenderer class from the attached zip. Because of JQuery 3 and that you are using JQueryUI 1.12.1 you have to include the migrate library, not including it isn't the best option. I've spent an entire day on just getting it working for our purposes, so I'm not going to start on this, I'll leave this to you guys to sort out. End of the day it really looks like this widget never went through any test cycle. 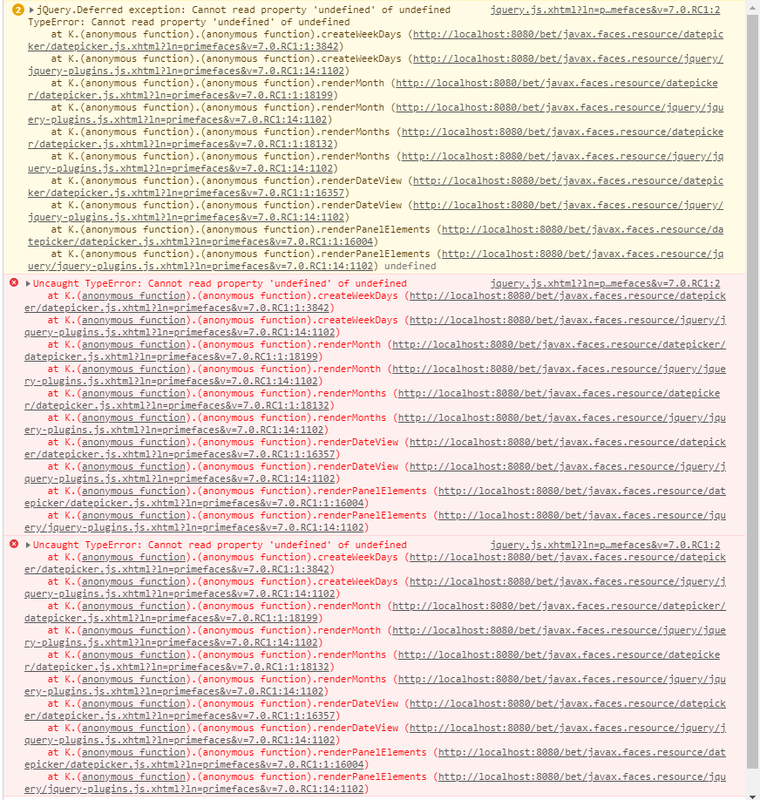 I mean not including required JS (-plugins.js), the html was incorrect and JS that PF is running isn't right. Please can we fix this widget up? It really is a winner business-case wise, but it just doesn't work and requires a lot of fiddling to make it work. Oh, you can't upload zips. discussed with @GedMarc. I asked him to create individualy issues on the Github page for each issue so they can be debugged and fixed.